Walking is one of the most exciting milestones any baby can reach. If your child is starting to show a desire for self-transportation and yet still couldn't walk, a walker might be of great help. If you’re considering getting one for your child, this post will help you pick the best baby walker. Considering all the controversy regarding the use of baby walkers, parents can’t help but think twice whether to get one for their child or not. The good news is that ASTM International has provided test methods for infant walkers meant to minimize accidents and ensure the safety of children using them. It’s true that the risks remain, but parents can now have more confidence that newer models of baby walkers are designed to meet safety standards. In addition to that, we’ve come up with a list of five of the safest infant walkers available on the market today. We are positive that our top pick is something that you and your child will surely appreciate. First on our list is the My Child Car Walker. It’s a great choice if you want to teach your child make-believe. The walker comes with a steering wheel and a horn so that your baby can “drive along” as he practices his balancing skills. 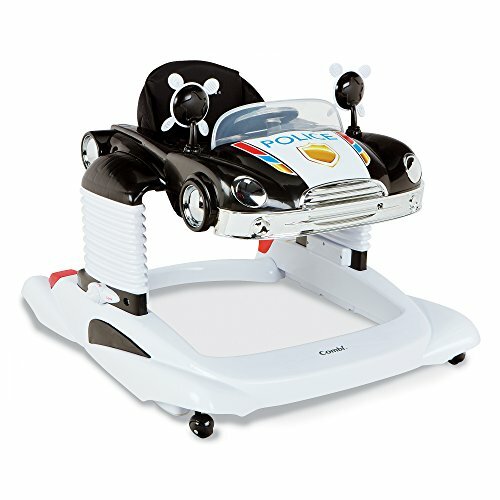 It’s suitable for children ages six months and above and can be used both as a walker and a rocker. 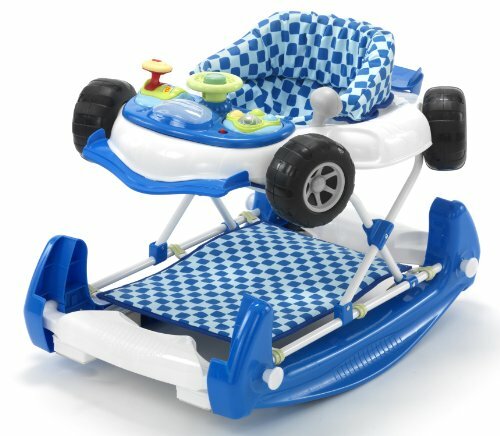 It features an adjustable seat, a detachable play tray with sound and light functions, and car-themed toys for your child to enjoy. It has a play tray that can really keep your child entertained. The tray can be used for eating. It may be too large and difficult to store. It’s a bit difficult to maneuver, especially on the carpet, which can be frustrating for your child. 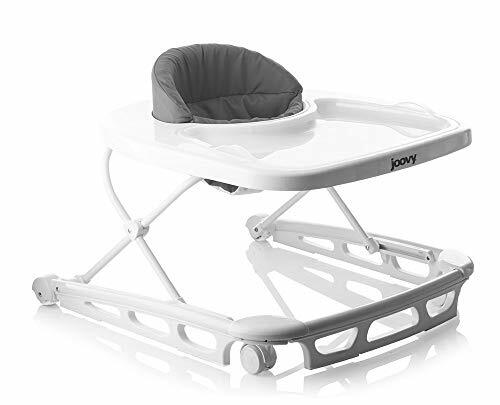 For mommies and daddies looking for a walker that can also function as a highchair, the Joovy Spoon Walker might be what you’re looking for. It features a large tray that can accommodate your child as he eats and can also serve as space for your little one to play with his toys. The walker provides three height positions and is ideal for a child who can already sit upright without assistance. What makes this walker unique is its steel frame, oversized wheels, non-slip stair pads, and minimalist design that can make it a good addition to any household. It’s very elegant-looking with clean, contemporary design. It has an ultra-wide base that makes sure your child doesn’t tip or fall over easily. It’s a bit huge, but it can fold flat for easy travel and storage. The tray is removable for easy cleaning. It costs twice as much as other models in its category. This Wonder Walker by Hape is more of a trailer than a traditional walker, perfect for parents who worry about the risks associated with the latter. 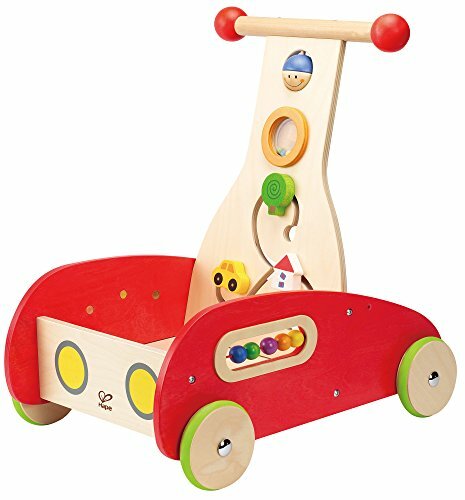 It’s a colorful wooden cart that comes with adjustable knobs and gears designed to help your baby develop fine motor skills and coordination. It features rubber-rimmed wheels and non-toxic finishes, as well as a platform/storage that allows your child to carry his toys along. With the handle being around 20 inches high, this walker is just the right height for babies who are just learning to walk. The rubber-rimmed wheels prevent the walker from sliding too fast. It’s made of solid wood and is very sturdy. It’s not your regular walker, and its features may be really entertaining for most children. The front wheels do not turn left or right, so it just moves forward in one direction unless an adult lifts and turns it. For parents looking for more than just a plain walker, the Combi All-In-One Mobile Entertainer might be a great option. It’s an all-around walker that lets your child explore his surroundings and perform movements he may not be old enough to perform yet such as standing and jumping. It features a three-position height adjustment and comes with an electronic play tray. It also comes with a “car hood” that can be detached and converted into a tray surface for your child’s snack time. All the fun lights and sounds can really keep your child happy and entertained. The height adjustment feature makes sure the walker grows with your child. Parents might find some of the features that make the walker very expensive unnecessary. The leg holes might be too small for larger babies. 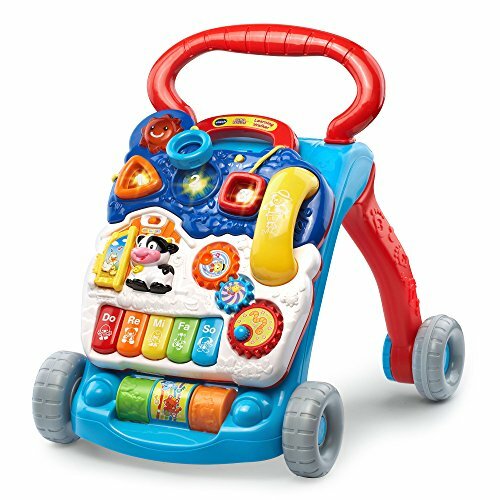 If you’re looking for a walker that may have it all but doesn’t cost that much, you might find what you need from this Learning Walker by VTech. It’s a sit-to-stand walker that features a removable play panel. The play panel alone includes a toy piano that produces animal sounds, a shape-sorter, a toy telephone, two spinning rollers, and three moving gears. When your child is not playing, he can get up on his feet and learn to balance himself with the walker. The slim design makes it easy to store. It comes with a tension control dial that lets you adjust how hard or easy it is to push the cart. The rear wheels come with rubber seams to prevent the cart from sliding. It’s rather sturdy for its size and appearance. The colors and the sounds may be too stimulating. For this particular selection, our vote goes to the VTech Sit-to-Stand Learning Walker. The simple explanation is that for its price, it seems to have just what a child who’s learning to walk needs. The removable interactive play panel can keep your child entertained, and when he’s ready to go mobile, he can simply grab the handle and push the cart around. Regarding safety, the product doesn’t have any small parts your child could choke on. The speed is also adjustable, so there’s really no problem with your child going too fast on it. Some parents argue that there is no “best” baby walker and that they should be totally banned because of the risks that come with using them. In our opinion, how good or bad a walker depends on how it’s used. It’s really important that parents to do their research and make an educated choice as opposed to simply buying what they think is good enough for their child. Most importantly, we highly encourage parents to observe safety practices (including the ones we mentioned above) when letting their child use a walker. As is with other baby products, most baby walker-related accidents occur when parents are not carefully watching over their child. Before we go, we want to leave you with this quote from a parent who doesn’t want to identify herself. Let us know what you think about it by sharing your thoughts in the comments section. There’s a lot of controversy surrounding the use of baby walkers. The American Academy of Pediatrics discourages its use citing the fact that it can delay the mental and motor development of children. Many parents all around the world still practice the use of walkers, however, for the purpose of entertaining their child who is just starting to have an increase in mobility but still can’t walk yet. Some parents also consider putting their children in walkers for short periods so they can focus on household chores. Since their invention in the early 1500’s, baby walkers have been found by many parents to be of great help inside the home. Among its main advantages is helping a child stay in one place while the mother is attending to other things such as cleaning the house or preparing the food. It provides some peace of mind as well for parents with children who are just learning to run around. Another benefit of a baby walker is that it can aid a child to stay upright and help him maneuver unassisted. It can also contribute to strengthening the lower leg muscles. There are also disadvantages and risks to letting your child use a walker. Aside to what has already been mentioned earlier regarding its use causing mental and motor developmental delay, it has been found to cause injuries, 75% of which involve stairs. A small number of injuries also include pinching of fingers and toes, as well as burns, and in very rare cases, poisoning. Baby walkers are supposed to help children learn how to walk. To ensure that your child gets the most out of this device without putting his safety at risk, here are a few pointers to keep in mind. Consider a walker that’s easy for your baby to maneuver. A walker that’s too cumbersome and difficult to move due to too much friction between it and the floor may not only discourage your child to use it but can also lead to accidents. Pick a walker with a wide body and base. A walker with excellent base support will have a tiny chance of tipping over. It’s also going to prevent your child from entering doorways that may lead to the stairs or to rooms that are off-limits. Look for a model with additional safety features. Some models come with wheel locks and seat belts. Such features will help using a walker a safe experience for your little one. Watch out for parts that pose as choking hazards. Manufacturers try to improve the quality of their products by adding toys that help entertain children while they’re in the walker. Make sure the parts are not too small for your baby to choke on. Be wary of poor finishes and manufacturing defects. If you notice even a slight defect in the product, have it replaced with a non-defective one. Poor finishes, especially on the base, are what usually cause the walker to be difficult to maneuver. Don’t give your child too much room to play. A walker may not be as fast as a ride-on toy car, but it can add some speed and get your child into trouble. This is especially true if your child already knows how to push himself down the corridor. To prevent accidents, don’t place your child in a room where he can gather enough speed to hurt himself. Only put your baby in a room with no sharp or small objects. Since a walker lets your child roam freely, make sure you keep dangerous objects far from his reach. Never leave your child on his walker alone. Walker-related accidents usually occur when the child is left alone to wander near stairs or high floor edges. Moreover, make sure you also install a baby gate at the entrance of the stairs if you have stairs at home. A baby walker provides me with peace of mind and lets me do my chores while my child plays. But frankly, I don’t think it’s a must-have.